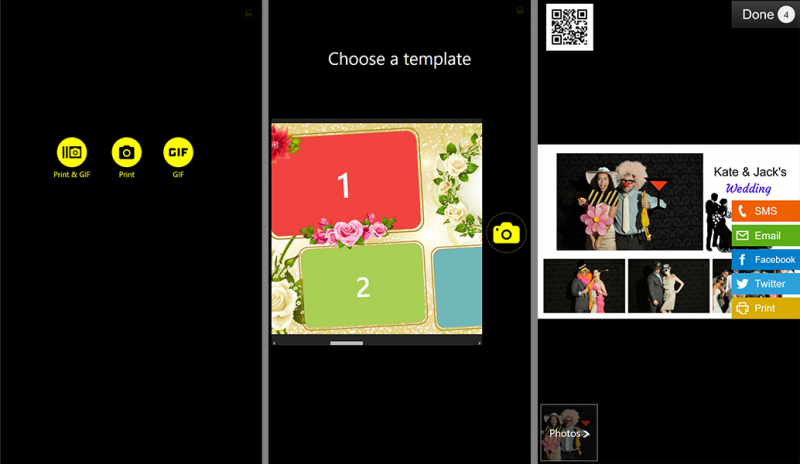 Let your guests add digital props to their individual photos. Use the built-in props in dslrBooth or upload your own props. Settings > Effects > Digital Props. You can now pre-configure each of your events in dslrBooth with different settings. This will make it easy to run multiple events on a busy weekend or to have different presets for your booths that you can switch to quickly. You can do this from the Event dropdown in the main menu. 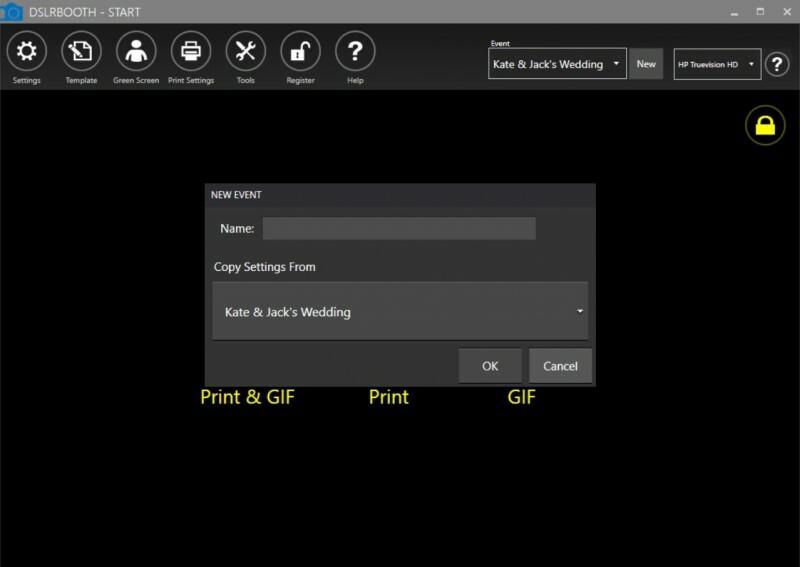 When creating a new event, you can copy its settings from an existing event as well. Sort template dropdown by date modified or alphabetically. You have the option to hide the retake/cancel button. This is useful if you accept payment for your booths using a coin or credit card acceptor or if you simply don’t want guests to have the option to retake photos. Settings > Display > Capture Screen. You can now send SMS messages to countries different than your Twilio From number. This is useful if you want to send from a different country than where your guests are located and is useful for countries that don’t have SMS sending numbers yet. Add the country code for your country in Settings > Sharing > SMS. The Country Code will get prepended to your guests number in the background so they don’t have to enter it in. The Start Screen icons and Done button will automatically be raised to the upper third of the screen when using vertical screens such as those used for mirror booths. Also, when using multiple templates with a vertical screen, the capture button is moved to the right side. The ability to automatically upload to a Facebook Profile Page has been removed due to changes in Facebook’s privacy policies. However, you can continue to share to a Facebook Page as before. Upload other photos to your fotoShare albums. Useful for uploading individual photos. Requires a paid plan. New option to delete shares. Option to delete an entire album. Fix for start screen animation not playing when only one booth mode option is selected. Fix for generating GIFs 32 bit systems. Delete RAW images when user rejects disclaimer. Fix for Crop Live View not showing in display settings. Fix for single photos not appearing on sharing screen if filename already existed. Fix browse button does not appearing on start screen for GIF only sessions. Hide signature feature for GIF only sessions. Fix rare template processing issue. Remove sharing to Facebook by Guests on the Sharing Screen as Facebook no longer allows apps such as dslrBooth from posting photos. Guard against corrupt settings file causing application not to start. Fix for some compression settings not working for Nikon D7100, D7500. Fix for template editor failing to delete templates. Fix for last opened event sometimes not opening after app is restarted. Fix for settings getting corrupted on some machines when computer is shut-down unexpectedly. Fix for settings not getting saved for new installs and updates from much older versions. Fix for registration issues with some new installs. This is a FREE update if you have purchased dslrBooth within the last year or have purchased a renewal license. To update your software, open dslrBooth, then go to Help, Check for Updates.